Having experimented with software algorithms to enhance the PLab-3 spectrometer data, I decided to experiment with a two higher pixel-density webcams; with monochrome as one of those. The objective was to look at the effect of the hardware sensor on the recovered spectrum and to gain a better understanding of the cost / performance trade-off. 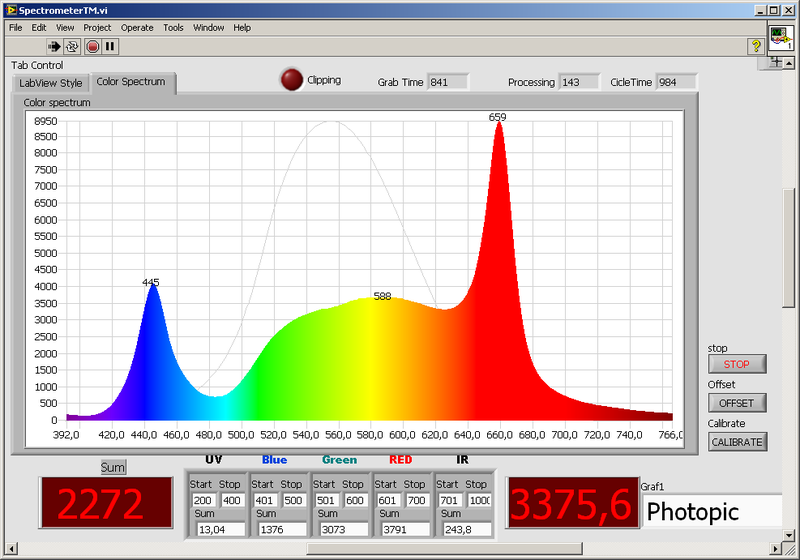 The same source light conditions were created for each spectrometer test and the Matlab test software was designed to recover only native-mode pixel data. The data presented here raises additional questions not answered by any of these three designs so this note just represents a starting point. Finally, an advantage with programming the interface for all three (3) cameras is that the exposure can be set to 'manual' and other features such as brightness, gain, contrast, temp deg-k, etc can be controlled -- though the specific setting options is not all the same for each camera (and the monochrome has only a couple). While the monochrome webcam is quite expensive, it was valuable to include because it is 1) higher native resolution, 2) it does not have the RGGB Bayer filter or the JPEG effects and 3) it has 12-bit dynamic range (as opposed to the RGB cameras at 8-bit depth. The 1920x1080 resolution webcam is moderately priced so provides an interesting combination of price-performance. [SANM] Obviously, the PLab-3 SANM camera is available from PLab. [OVA-2710] This camera is from ELP and can be found on Amazon for about $45. [MT9P031] The monochrome camera is available from the Mfg E-Con and is expensive. [LENS] Both of these camera will require a new 8mm M12 lens from Amazon for about $6; a minor additional cost. All plots show normalized values, CFL-calibrated wavelengths to a calculated 0.1nm resolution and Solux 4700K gain-corrected intensity. The first plot is the now-traditional comparison of a 2700K CFL. This next plot is the same data; just a "zoom-in" look at the green 546nm peak to observe the differentiation of the "double peak" to give a general sense of resolution. The next plot looks to observe the effect of using a 0.12mm slit made from two sharp blade edges and a film-based slit while looking closely at the green 546nm double-peak of the SANM camera. Next, I attempted to measure the true spectrometer resolution by observing a ~650nm pocket laser and calculating the approximate Full Width Half Max (FWHM) bandwidth. Using a laser for this measurement is valid because lasers are extremely narrow bandwidth so the measured value is going to be many, many times wider than the actual source. It appears possible to achieve ~1nm resolution. The plot below shows 1) the reference Solux 4700K output spectrum and the gain-calibrated measured Solux spectras of each of the webcams. Note that while all corrected spectra closely fit the Solux curve, each webcam shows its own sensitivity bandwidth. Finally, this plot shows the Solux gain-corrected spectra of November mid-day sun (as measured through a double-glazed window) as compared with a "typical ideal" solar spectra. The fact that they are all different from the "ideal" was not too surprising. It should also be noted that taking a solar spectra is a difficult challenge. Great to see this comparison. Do you have a link to where these webcams might be purchased, and prices? Also - I think you had some thoughts on the Raspberry Pi camera which is pretty affordable and high resolution. Would you mind linking to them or re-iterating here? I just bought one myself, and during the #webvalley tests this past summer found that they have very low baseline noise in the "black" regions of a spectrum. Jeff, I inserted the component details in the note above, just before the plots. 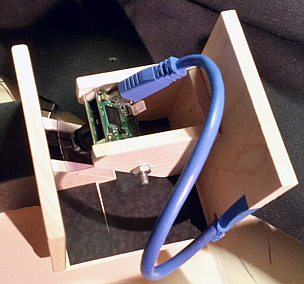 As to the RPi camera, it seems to have two "difficulties" which need solutions: 1) a "convenient" solution for interfacing the camera, controlling parameters and extracting image data from it (i.e. USB or other? ... I've just not seen a clean option) and 2) the lens. The mount and lens are very small and I've discovered (as noted in the above note) that a better lens (~8mm) is really necessary. All the added pixel data is useless if the lens is junk. 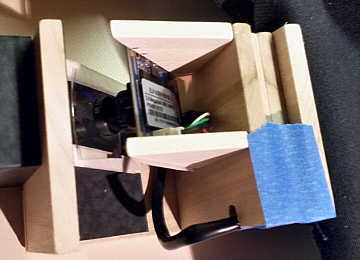 There has been some hacks to the RPi for other mounts, but the RPi board is very small so the hacks are not easy or a clean drop-in -- from what I've found so far. I also have not found specs on the chip sensitivity and dynamic range -- which is necessary for comparing cameras. If the sensitivity is low, then the background noise can also "seem better" -- but that is not a measure of image "quality" -- it is sensitivity and dynamic range that count. Also, it would be good to compare cost of RPi + uC vs USB module types. The added pixel resolution of the monochrome I used did not appear to provide "clearly better" results than the more moderate cost ELP. No, that is not definitive numbers, but it just indicates additional details worth observing so as to compare specs that are of importance to the resulting spectra. So, I'm not rejecting the RPi, it just does not yet appear to be a drop-in option. What I've read is that the RPi camera used to use the OV5647 camera chip but has "upgraded" (changed chips) to a Sony IMX 219 PQ CMOS image sensor for which I've not found comprehensive specs -- like sensitivity and dynamic range. They only claim 3280x2464 native and 44.5dB "PGA" max -- which 'might be' related to dynamic range, but does not state it is -- and no sensitivity or sensitivity curves. The PLab link you gave to the OV5647 did not have that data either. That chip is 2592x1944 but the spec sheet does not quote sensitivity or dynamic range. khufkens-pi-camera-response-curves-3342e29_-3-.zip @warren,@stoft This may provide additional info. @stef, thanks for the curve data. While the data is useful for comparison with relative sensitivity curves of other cameras, the data, unfortunately, is all relative values and did not include specific information about sensor chip absolute sensitivity, noise or dynamic range. All silicon sensors have similar response curves, as do camera Bayer filters, but their absolute sensitivity, noise and dynamic range can be quite different -- and those three factors play a more important role within a spectrometer application. I tried this camera https://www.aliexpress.com/item/HD-Surveillance-camera-1080p-Full-Hd-MJPEG-30fps-High-Speed-CMOS-OV2710-Mini-CCTV-Android/32811887520.html , but it have a bug with manual exposure setting. The exposure is set to a drastically lower value (picture is dark), so for spectrometer is useless. Nice graphics. Yes, white LEDs are not broad spectrum. If it's of any help, I set (Matlab code) the ELP camera to: Manual Exposure, Exposure=-3 (-14:-1 range), Gain=0 (0:100), Gamma=100 (70:500), Brightness=0 (-64:+64), White Balance=Manual, WB=6500 (2800:6500), Contrast=32 (0:64), Sharpness=2 (0:6), FrameRate=12 (12.000), Brightness=64 (1:128).